Considering moving your child from a crib to a toddler bed? Ready to end bed-sharing in the family bed? The good news is that there is no single, definitive answer to the question of what age a child should be when you move them to a bed of their own. The bad news is that there is no single, definitive answer and, as parents, aren't certainty and clarity what we often crave? It seems that despite the wide range of ages that folks tend to transition their kiddos' sleeping arrangements, the impending arrival of a younger sibling is quite often the impetus for the change. Our case was no different. What may have made our situation a little unique is that I've always wanted a Montessori Floor Bed for our baby instead of a crib. Unfortunately we had to change that plan in the face of baby sleep problems. You can read more about the 9 surprising things we did when our baby quit sleeping. So the idea of ditching the crib at 12 months was really appealing to me! We planned to transition our baby to a toddler bed several months before the new baby's arrival and then move him to a queen-sized mattress on a very low platform in his new big boy room a month before our due date. Well, I jumped the gun and turned his crib (the super affordable IKEA Sniglar) into a toddler bed just after his first birthday - a full 5 months before baby 2. The primary reason was that my back was feeling the pain of lifting an 26 pounder in and out of the crib. The secondary reason is that I was having a rough week and was ready for a change - frequent night wakings and nursings were taking a toll on me and I was willing to take some short-term pains in exchange for long-term sleep gains. I told my husband that it was an experiment and that we could switch back to the crib if we needed to, but deep-down I was feeling pretty committed to doing whatever it took to make the toddler bed work. Another common reason for making the move away from the crib (or cot as the Brits call it) is a child who becomes a crib escape artist. That's how Katelyn from What's Up Fagans knew her twins were ready for toddler beds. Depending on your child's height, this could happen early or late in the toddler years. But with our tall guy standing 33" at 12 months, the general recommendation to transition once your child is 36" tall was looming just a few months ahead of us. How you prepare your child for the transition to a "big kid bed" will be highly dependent on your child's age and temperament. At 12 months old, there wasn't a whole lot of build-up or excitement. Rowan doesn't know what a "big boy bed" is and his ability to plan and predict the future is minimal. But he's resilient to change and generally "goes with the flow" pretty well. The only real prep I gave Rowan was letting him play on the toddler bed in the hours before bedtime so that he could practice getting on and off. Had my move to the big kid bed not been made in a fit of impulsivity one afternoon when my back was throbbing, I would have written a social story about it and read it during the transition, since that technique has really helped us communicate expectations with our young toddler. For older toddlers, it seems parents often spend weeks or months preparing their kiddos for the big move and make a big deal about the "big kid bed." Christie Burnett, an early childhood teacher and editor of Childhood 101 shares her experience preparing and transitioning an almost 3 year old to a big kid bed. The Outlaw mom used an Elmo book to help prepare her toddler for the move from the crib. One thing to consider is whether your child's first sleep in a new bed will be during a nap or overnight. At naptime, the stakes are lower - you won't be woken up from your sleep to troubleshoot issues. But starting at bedtime means the room is dark and your child will be less tempted to get up and out of bed. It's a tough decision and again, there's no right answer. Of the several things to consider when choosing a "big kid bed," safety is the most important. BABY-PROOF the room - even for a toddler. Cover outlets, anchor your furniture to the wall, conceal cords, anchor your furniture to the wall, get rid of breakables, did I mention to anchor your furniture to the wall?! Make sure there are no hard objects or surfaces to hit if your kiddo rolls out. Choose a low sleeping surface and/or use bed rails. Rowan's room was already thoroughly baby-proofed from our floor bed adventures, but I also posted a list of additional things to do/check before every nap and bedtime so we wouldn't forget: lock the trashcan, make sure the blind cords are up and the closet doors are completely closed. For the first few nights I layered blankets and his IKEA sheepskin rug beside the bed in case he rolled out. I quickly realized this wasn't needed and scaled back to just the sheepskin rug. We purchased a bed rail but didn't check that it fit toddler beds (it didn't). So we used a pool noodle to make a bed rail like Chanda of Pink Oatmeal did. The vast majority of parent reports I've read and heard described the transition as easier than expected. Not without some long nights or bumps in the night, but overall not as life-altering as they were bracing for. Overall, the transition went really smoothly for us. In fact, the first 2 nights our guy didn't seem to realize he could get out of the bed - instead, he stood in his usual corner of the crib (or at least the 3 sides of the crib that were still standing) and called out to me at his usual 2 nightly wake-ups. I actually night-weaned the same week that we transitioned Rowan to his toddler bed, and I wouldn't recommend others follow that model. But, like I said, I was having a hard day...or really a hard week of mothering...and just needed some things to change. We did have to modify the toddler bed set-up because our 12 month old would easily shift the pool noodle out of the way when he rolled up against it. He never fell out of the bed but he had several nights of uncharacteristically frequent wake-ups. I finally did some nighttime investigating (translation: I accidentally fell asleep on the floor next to his bed while trying to soothe him back to sleep without nursing) and discovered that he was getting out of bed in his sleep whenever any part of his body felt the edge or shifted the pool noodle out of the way to feel the edge. Then he was basically sleep walking - standing in his room not-quite-awake, confused and crying. Our solution was to completely remove the bottom of the crib and place the mattress on the floor. Our particular crib design left a nice wooden rail just at mattress height and that was enough to secure the pool noodle. Voila! Problem fixed (but I realize this might not work for all crib designs - a toddler bed rail would have done the trick, too). One challenge many parents face, especially with older toddler is the EARLY morning wakeup. Without being confined to the crib, your kiddo may be less likely to fall back asleep until a reasonable hour. I love Meghan at Playground Parkbench's tips for helping an older toddler learn to stay in their room in the morning despite early wake-ups. Many parents also struggle with keeping their child in their beds or in their rooms. read on to hear why I think making the transition at a younger age actually helps with this. Becky at Your Modern Family preaches the power of consistency for teaching older kids to stay in bed. You can use a baby gate or a door knob cover to prevent your child from escaping his room and roaming the house (again, see below for why we didn't have to deal with this at 12 months). Babies and young toddlers may not be fighting sleep or resisting bedtime yet. He may not have mastered sleeping through the night, but our guy easily falls asleep for bedtimes and naptime. He's too young to call out that he needs water and has to go potty and has a toe-ache. If your little one isn't yet fighting sleep, you might consider making the move to a big bed sooner rather than later. Babies and young toddlers are too short to reach the door handle. I've heard parents of older kiddos bemoan the transition to a big kid bed because their child won't stay in their room. Luckily for younger ones, this isn't an issue. As long you've totally baby-proofed, the whole room becomes effectively like the crib in terms of containing your child. An open bed supports self-regulation. This is the theory behind the Montessori Floor Bed that I've been most drawn to and I've been thrilled to see it in action. The earlier a child learns to go to sleep when they're sleepy and wake up when they're rested, the better! This self-awareness is one important aspect of self-regulation. Another important aspect is the ability for your child to choose activities that help him wind down for sleep. This might be talking or humming, rubbing a favorite toy, or having some quiet play before resting. At 12 months, if I put him down for a nap and he's genuinely not yet tired, he gets out of bed and plays quietly for 10-15 minutes. I can hear him talking quietly to himself as he looks at books, pushing his cars around and tapping with his toy hammer. Then he crawls into bed and goes to sleep (I'm not making this up - it's amazing!). He does occasionally start to cry or bang the door after that brief playtime and I just put him back in bed with his sleep cues and he easily falls asleep after I shut the door. I call this "reminding him of the task at hand" and it works like a charm because he's wound himself down enough to fall asleep. 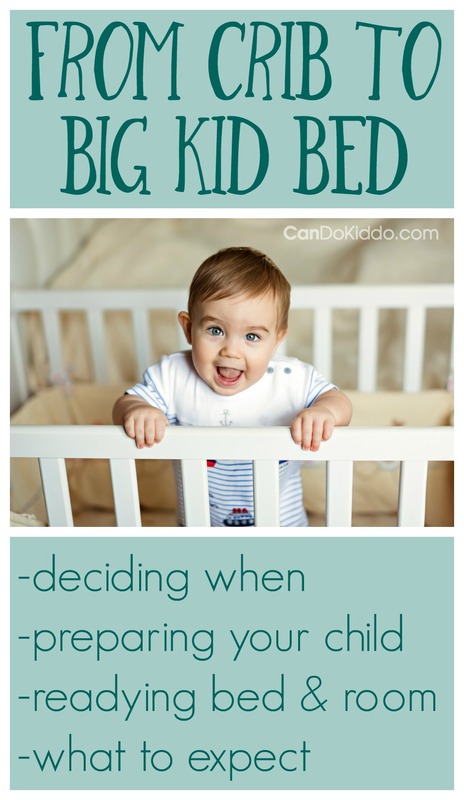 Are YOU Ready to Move Your Kiddo to a Big Kid Bed?! What do you think - are you ready? Is your kiddo ready? Or is the crib still the right fit for your family? Leave a comment below or hop on over to the CanDo Kiddo Facebook page to join the conversation. Join thousands of other parents! Receive CanDo Kiddo play ideas, developmental tips and parenting inspiration delivered free to your INBOX. Reader Q+A: Is Tummy Time Mean or Cruel If My Baby Can't Hold Her Head Up Yet?